Admission to the Japan Society Gallery is free of charge from 6:00 p.m. to 9:00 p.m. on Fridays. A docent tour of the gallery is available Fridays at 7:00 p.m. A Japanese language tour is available Fridays at 6:00 p.m.. Tours last about an hour. The Japan Society seeks to bring the people of Japan and the United States closer together through the presentation of innovative programs in arts and culture, public policy, business, language, and education. The Japan Society’s gallery is one of the top U.S. exhibitors of Japanese art. Exhibitions are displayed in the modestly-sized gallery on a changing basis, representing a wide variety of art forms from the ancient to the contemporary. Visit the Japan Society website for information on the current exhibition. The gallery is housed in a building designed by Japanese architect Junzo Yoshimura. In addition to the gallery space, the building contains a small indoor garden, reflecting pool and waterfall, furnishings by George Nakashima, a theater, library, language center, conference facilities, and administrative offices. Films, performances, and talks are regularly scheduled in the theater. See reviews and comments of visitors to the Japan Society Gallery. Regular admission to the Japan Society Gallery is $12. There’s a reduced $10 admission for students and seniors. Hours of operation are Tuesdays – Thursdays from noon to 7:00 p.m.; Fridays from noon to 9:00 p.m.; and Saturdays & Sundays from 11:00 a.m. to 5:00 p.m.. The gallery is closed on Mondays and on major holidays. Admission is free on Fridays from 6:00 p.m. to 9:00 p.m.. Note: Information is correct to the best of our knowledge at time of publication. Please check the Japan Society Gallery website to confirm details. 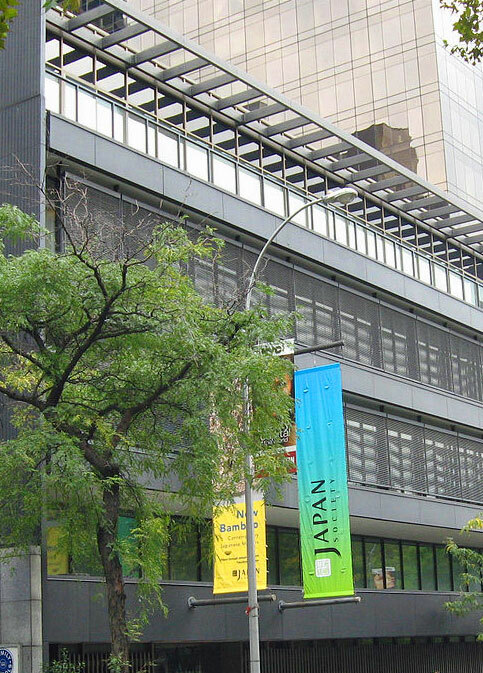 The Japan Society building is located near the United Nations, at 47th Street and 1st Avenue. The street address is 333 East 47th Street, New York, NY.